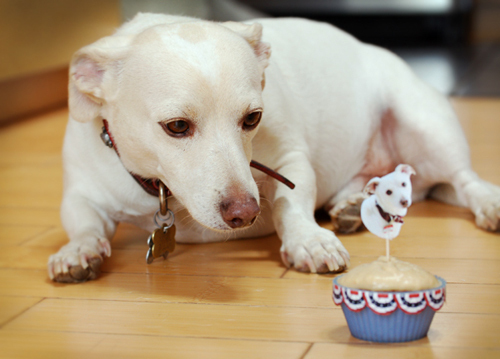 This is my dog, Butters, momentarily resisting a dog-friendly cupcake. (Pup-cake?) Butters – whether he is aware or not – is entered into a “Dog Mayor Election” hosted by our local tv station, KOFY TV. KOFY considers themselves a dog-friendly station; they have “Dog IDs” that they air during commercial breaks.. short clips of dogs sitting in a studio set that looks like a living room..with a blurb at the bottom displaying the name of the dog, and what city they live in. When I saw that they were having a dog election, obviously I had to enter Butters! Each dog at the audition had their Dog ID filmed for television as well, so regardless of who wins, we can still see Butters on tv at some point. Since Butters has been such a good sport - humoring his humans through the dog auditions, multiple campaign photos, etc. 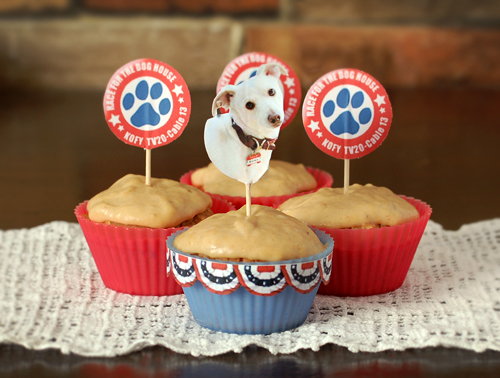 - I decided to make some dog-friendly cupcakes just for him! This is great! Definitely going to have to give this a try :) Good luck to Butters! I always feel so let down when I see a purportedly dog-friendly recipe that contains wheat :( Your boy is very handsome though! What about rice flour as a sub? That would work for most dogs! Mine is very food-sensitive and is grain-free, but maybe potato flour? I could swear I read a comment here about potatoes, and it was indeed another person saying their dog can't have potatoes. (Go figure!) If your dog can though, I would try it! I'd think that grain flour substitutes would be more readily accepted by a canine taste buds than by a human one - you know, not being as picky about finished product textures. :) I haven't experimented baking with other flour substitutes yet (although I want to.) 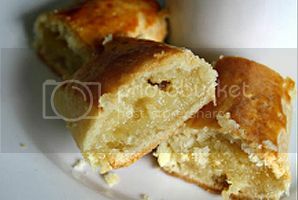 If you try it with the potato flour, will you let me know how they turn out? For *most* dogs, potatoes are a neutral - not problematic, but not super awesome. But it does depend on the individual! Anyway, so I was at the store looking at the potato flour and thought, you know, I bet this just wouldn't hold up well as a structural component. Maybe it does, I don't have a lot of experience with it, but I decided against paying for a $7 bag to experiment (as my husband says, "for the f*cking DOGS?!?" ;)) I thought, what else might be an Unexpected Protein, and went with chickpea flour ($3/bag, *ahem*). I don't actually like bananas, so I had my husband try a bite, he said it's less sweet than he would expect a human cake to be, but thought it wasn't bad. (Less water and less baking time with this flour, btw.) The dogs, well. My forever dog and my foster dog both give major paws up. AHHHH I am dying over how cute Butters is. Oh my gosh. This is the cutest story ever! Thank you for sharing. Argh! I was enamored with your dog even before I knew his name was Butters. He is adorable. I have plenty of friends with dogs, I'll have to remember this recipe. Butters has my vote! What a cutey-pie. This page was loaded Apr 26th 2019, 4:29 am GMT.